Author, Leah Kaminsky, is the GP for the Damiani family who were recently featured in the Australian Story program “Cracking the Code”. 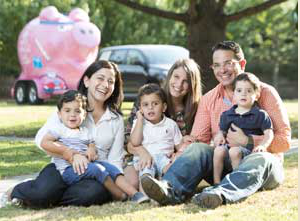 Four years ago, Stephen and Sally Damiani’s baby son Massimo succumbed to a mystery disease. In the space of a few weeks, the toddler lost the ability to eat and crawl. The prognosis was bleak and the cause mystifying. The story of the Damiani family’s search to diagnose their son Massimo is an inspiration that has set the world of genetic medicine and research buzzing with the possibilities for the future. Stephen Damiani and geneticist Ryan Taft have developed a diagnostic tool that will revolutionise diagnoses and treatments of diseases as complex and rare as Massimo’s leukodystrophy to widespread diseases that cost the global economy billions every year such as: diabetes, some forms of cancer, and cardiovascular disease. The Damiani family’s story has been described as a breathtaking example of how medicine can be transformed by the determination of ordinary people. Watch this space for more news and visit the Australian Story website to watch the program.